Before becoming a professor at Vanderbilt, Seligson served as the director of CLAS here at Pitt, where he held the Daniel H. Wallace Chair of Political Science. He has been a Fulbright Fellow and has received grants from a number of venerated foundations, and has published over 140 articles and 14 books. His most recent works focus on violence, racial discrimination, and economic inequality in Latin America. The Latin American Public Opinion Project (LAPOP), for which Seligson today serves as the Senior Advisor, was conceived with a study of democratic values in Costa Rica in 1972, a time in which Latin America and the Caribbean were overwhelmingly controlled by autocratic regimes that prohibited the study of public opinion. The political landscape has since changed, allowing for such studies to be carried out today in almost every country in the region. In his talk, Seligson described the small scale of the initial operation in Costa Rica in 1972. With his colleague (and now-wife) Susan Berk, he began doing field work with a sample size of 531 people—a sample that would be dwarfed by the number of interviews and surveys that LAPOP conducts today. He illustrated the scale of the work: it was he and Susan, living out of a Land Rover and leading their team through Costa Rica, conducting face-to-face interviews and collecting data. With such a small-scale operation, he was able to be directly involved with each of the people being interviewed—and since it was under his design and under his own direct supervision, he had no doubts at this time regarding the validity of the data being collected. Since its conception in 1972, Seligson’s small-scale operation in Costa Rica has expanded and snowballed to become the largest regional survey project in the Americas. One of LAPOP’s largest activities is the AmericasBarometer, a project working to measure democratic values and behaviors in the Americas through surveys. These studies are conducted through rounds of surveys, with more and more countries included with each round. AmericasBarometer began in 2004 with only eleven participating countries, and has since expanded to 29 countries and over 43,000 interviews. As Seligson explained in his January 19 talk, these are all face-to-face interviews—not conducted over the telephone or the internet. These interviews can be conducted in eight different languages, including Spanish, Portuguese, French, and various indigenous languages. 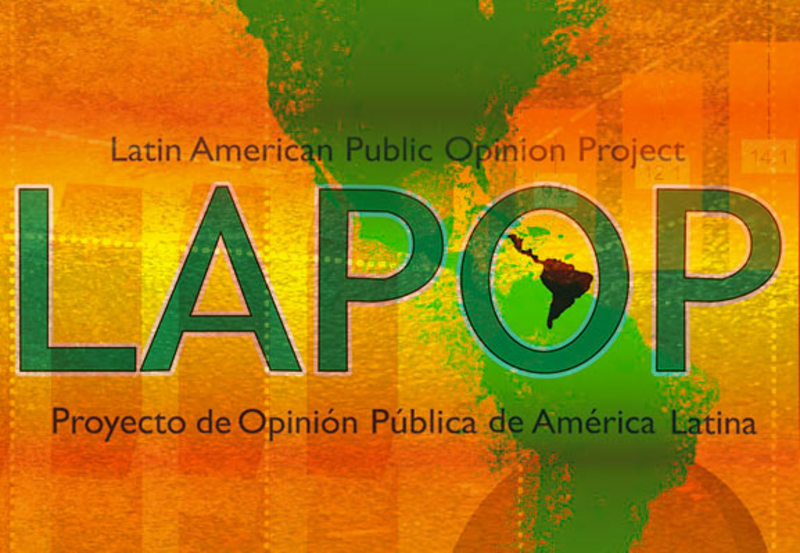 Throughout the years since its conception, LAPOP has developed an enormous wealth of databases of information on public opinions and political viewpoints across Latin America and the Caribbean, much of which has been used in various professional journals, dissertations, and academic texts. The information has also been utilized by U.S. agencies such as USAID in efforts to promote democracy in Latin America, and by agencies such as the World Bank, IADB, or the UNDP, in their reports and analyses. In his lecture, Seligson emphasized the difficulties associated with the massive growth of this project, particularly regarding the maintenance of quality control with the surveys and the results, while providing the smallest margin of error possible. He explained that, as the project expanded throughout more of Central and Latin America, he quickly lost control over the quality of the results, and he had no way to be sure of the accuracy or the validity of the data that he was receiving. However, in recent years, it appears that Seligson and his team have found ways around these questions of accuracy through modern technology. One of the specific methods of reintroducing quality control in surveys was to insert certain consistency checks, using Geofencing Technology to ensure that interviewers are being honest about their locations. In addition to this, LAPOP now uses cameras and microphones to capture the interviewer (these do not capture the person being interviewed as to preserve anonymity) and ensure that they are asking the correct questions in the correct way. These checks, along with several others, have been put into place to ensure a certain level of quality control in the LAPOP and AmericasBarometer surveys, despite their ever-growing reach. After discussing some of these challenges and technological advancements, Seligson went on to give an overview of a few of the major findings in the 2016-2017 round of interviews. Overall, he determined from his results that democracy as a whole appears to be on the defense in Latin America—meaning that support for democracy has eroded, trust in elections and political parties is low, and party affiliation has decreased substantially. LAPOP’s most recent findings determined that only an average of 58% still support democracy. Of course, these results vary from country to country, with Guatemala showing the lowest amount of support for democracy, and Uruguay showing the highest. However, the results are shocking, and disappointing to pro-democracy spectators from the U.S.
Not only does support for democracy appear to be in decline, but support for certain authoritarian activities may be trending upward. For example, there has been an uptick in approval for the prospect of the President shutting down congress and taking over the government. While this number is still low, lingering around 20%, it is still an alarmingly high percentage. The country with the highest percentage of respondents in support of this idea was Peru. In addition to these trends, there were some unexpected findings from the 2016-2017 round of LAPOP surveys and interviews that shocked analysts even more. For example, it appears that trust in political parties is fairly low—while this isn’t necessarily surprising, it seems that trust in political parties is actually higher in more authoritarian countries such as Nicaragua, and lower in democratic countries such as Peru. Another finding that is puzzling to analysts is that, while trust in the media has decreased throughout the Americas (including the U.S.), trust in the media is actually lowest in countries where the media is considered to be the freest (i.e. not controlled by the government). Given that each interview for LAPOP is expected to take 45-50 minutes, there are countless other discoveries and conclusions that can be drawn from the data extracted from the 2016-2017 round of surveys—all of which is available on the LAPOP website. However, the overall trend, as illustrated in Professor Seligson’s January 19 discussion, appears to be that trust and confidence in democracy is in a state of decline in Latin America, and that support for more authoritarian forms of leadership may be on the rise.